Are you looking to get a proper deep clean and improve your overall complexion? Go behind the scenes with our co-owner and pro makeup artist Danielle Schleese as she goes through the unboxing of our top selling facial tool The BFF. Is this your first time on our blog? If you’re newer to the community, this video is one piece of the blog. So I thought you’d like to know—there’s a lot more to see! We try to put up new posts weekly. If you want more behind the scenes videos of our lives and how we live, and you want to be a part of a community of women doing amazing things, then also join me on Instagram @holisticbeauties. You can see more blog posts by clicking here. 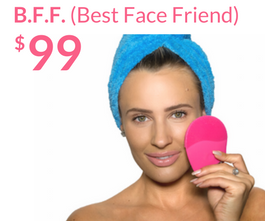 The BFF (Best Face Friend) is our top of the line facial cleansing tool that uses Sonic, High Frequency vibrations to give your face the deepest clean possible. Shop with us today and see the Holistic Beauties difference! Try our Products out for 60 days and if it doesn’t work for you, you’ll get your money back! There’s absolutely no-risk in giving it a try. No questions asked, you can get your money back! Spacious bag, perfect for finding make up quickly on the go. I love that you can put only essentials in the bag and keep it in your purse or you can use it as a travel bag and just adjust the size. These are THE products I've been waiting for all my life. After two months of using the BFF instead of my Clarisonic, my skin is so clear and I frequently need less makeup on my face! SO SO HAPPY! This is probably my best purchase on holistic beauties to date. i am so in love with this product i can't imagine my life without it. Being a germaphobe I love the fact that bacteria can’t grow and i'm already seeing amazing results in 1 week! Get to know our founders! Find out what makes us different and why we do what we do! Join the Holistic Beauties club to enter our monthly giveaway draw, receive special discount codes, exclusive videos, and more! © 2019 Holistic Beauties. All rights reserved.